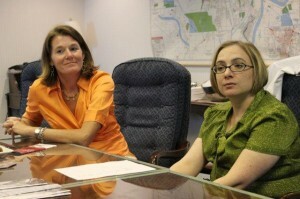 Answering Questions: Rebecca Winchell, left, Dr. Andrea Toomer, right. The first-ever meeting of the Brain Aneurysm Support Group on the south shore of New Orleans was informative and a great way to launch our program. We met at West Jefferson Medical Center where Dr. Andrea Toomer answered questions about recovering from an aneurysm, stroke or brain injury. Dr. Toomer emphasized the importance of asking your doctor about the latest in rehabilitation treatments. She urged survivors to see a rehab specialist if they are still suffering from limitations. She said there are always new developments to treat lingering conditions like limited movement, headaches, sleeplessness, etc. We will be posting video excerpts from Dr. Toomer’s discussion on this website, so check back!